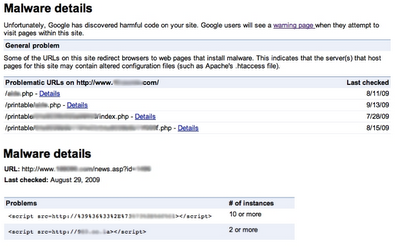 Official Google Webmaster Central Blog: When and why was my site flagged for malware? Learn in near real-time! When and why was my site flagged for malware? Learn in near real-time! , the malware review form, and our Malware details Labs feature. As of today, once we notice your site is infected, we’ll do our best to send an e-mail to the address you have associated with your account in Webmaster Tools. We believe malware is such an important issue for site owners that being quickly informed is beneficial to you and your website’s visitors. In addition, we’ve promoted our Malware details feature out of Labs and placed it under Diagnostics. The malware data is now updated four times faster than before, we’ve updated our algorithms for identifying injected content, and we’re now able to identify exploits which we were unable to catch earlier. We hope this allows you to stay up-to-date with any malware issues we detect on your site, and to fix them quickly. As always, please let us know if you have any feedback or questions about how to fix malware-related issues in our Webmaster Help Forum. We’ve been hearing this question for many years from webmasters. That’s why we built features such as the Safe Browsing API, the malware review form, and our Malware details Labs feature.